Political persuasion and leaning is an interesting phenomenon in Australia. I feel that most Australians are unaware of whether their preferred party represents their personal politics ( be they left or right wing ). More often their vote is based on an assumption of what these parties represent. An assumption that, more often than not, is not evidence based. The ABC’s positioning of the main party’s position on the left/right and Liberalism/Conservatism scale. There are various Vote Compass tools available across the Internet to guide one as to what side of the political spectrum one might like given your opinions. The ABC has developed a relatively simple Vote Compass mechanism with often only 30 questions using a 5 point scale from strongly disagree to agree strongly. The questions themselves are region specific issues as raised by the political parties or current polling data. It is a relatively recent invention for diagnostic analysis by the ABC based on technologies far older and better researched. The ABC still treats the Labor Party as a left-wing organisation. This basis of the perception is community attitudes and the apparent political reluctance for the ABC and the “political scientists” who designed the “compass”, to radically challenge localised conceptions, preferred by the ALP. Each successive government have in one manner or another denounced the ABC for criticising the government of the day and as controllers of their funding has indeed punished our public broadcaster for its perceived impertinence. So it is understandable, that upsetting the apple cart is not always in ABC’s best interest. It should, although, be held in credit for the ABC, that they continue to be courageously reporting the failings of any government. The ALP sees themselves as “a democratic socialist party” which was certainly true once, but is it still? There are certainly people within that party who belong to right and left factions, but the party as a whole cannot be both. The party as defined by what it supports and the policies it has, must by logical necessity, establish itself as one or the other, independent of its internal divisions. Given the Labor party’s close alignment to, as well as the bipartisan endorsement of, many Liberal-National coalition policies – where the LNP identifies as a right-wing party. I found this perplexing. The Australian media and the public treat both Labor and Liberal as different sides of the coin, politically. I have also always found it unusual that a family member who was an active member of a local Liberal party branch, in reaction to any criticism of the Liberals, suggested that if I wish to be politically engaged, I should join the Labor party as it was the alternative. (I am not nor ever have been a member of the Labor, Liberal or Greens party.) To his mind, and indeed many others like him, they fail to see that the variation between the two main parties, is today – and has the last decade at least – minimal. One needs to ask, how do these parties stack up in a wider and more generic, global perspective as opposed to our myopic national perception? The world used to see the “left” and “right” political spectrum regarding American capitalism versus the communist Soviet Union. The Soviet Union — as the left polar opposite to the right — began to restructure with Gorbachev’s policies of glasnost and perestroika in the 1980s. In the later part of that decade as the walls came down in Berlin and the Right-wing began to think they had won. It is also relevant to note that this attitude of having “won the fight” was prevalent in the 1980s when men like Tony Abbott, Joe Hockey, Christopher Pine and company were at college developing their frameworks for political engagement. A more global Political Compass! A very different take on the political landscape of Australia at the 2013 Election. “The Political Compass” which fits a more universal and international perspective of democracies across the world has been analysing OECD democracies since 2001. The left–right division – that we assume parties in opposition to one another may lean towards are increasingly becoming blurred in their oppositional dialogue between separate parties. The question about a real political choice between “left” and “right” should be asked within a global perspective. 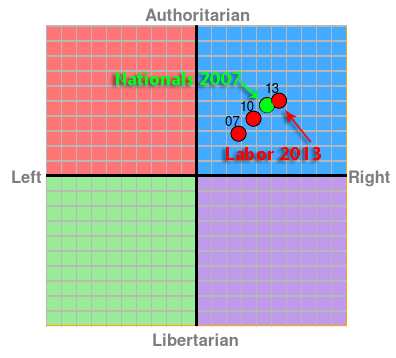 The political compass provides a much more accurate assessment of the actual nature of the Liberal and Labor parties in the Australian democracy (and for that matter several other democracies such as the UK, Canada, America, Germany, New Zealand, Irish, and European Governments). From 1972 to 1975 Australia was managed by a Left-wing party led by the now deceased Gough Whitlam. Reacting to a long run of conservative political leadership, the Australian electorate voted Whitlam and his agenda into power. From the perspective of where Australia had been, his policies seemed radical. Some suggest that in comparison with the world stage, Gough was predominately only playing catch-up with many more progressive countries that had already gone down the path Gough was following. He admitted this in his 1969 election policy speech in Sydney Town Hall about education, but to many Australians, especially the Right-wing, it was radical politics. While “The Political Compass” has taken no stock or measure of what the Labor Party looked like then, I suspect given the history of the movement of the Labor party in the socioeconomic, political spectrum, and it would be fair to suggest it was a legitimately Left-wing party at that time. After a return to the right-wing with Malcolm Frazer, the Labor party returned to power. The leftward leaning of Labor began to dissolve after 1983 as successive Labor Prime Ministers in the Hawke and Keating governments increasingly embraced the right-wing considerations of economic rationalism into their policies. During that time and throughout the John Howard and Rudd/Gillard administrations the political platforms of both major parties moved steadily to the Right. The chase to the right by Labor to keep up with the Liberals almost suggests Labor has no confidence in the ideologies they were founded on and appear to believe the Liberals are “right”, in more ways than one. The rise in authoritarianism as opposed to progressive philosophical positions became evident in the Keating government with mandatory detention policies. The Liberals themselves since Howard are following a favourable interpretation of the racist zeitgeist as captured by One Nation. Until One Nation, no one in politics imagined racism as a strategy could be a successfully exploited, in what we all imagined was an egalitarian country. With One Nation the political climate took a sharp turn to the right as successive parties realised departing from the egalitarian ethos of the Whitlam era, could garner votes in the community. Hence the rise of the ostracism of foreign nationals who approach Australia, seeking refuge as asylum seekers and their subsequent ill-treatment in mandatory detention. The Progressive Shift of Labor in the last decade further to the “Right”! 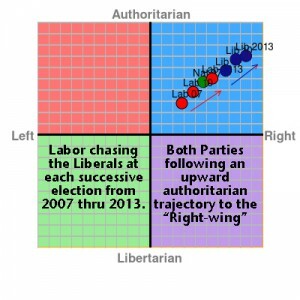 Since 2001, although, “The Political Compass” has charted the Labor party steadily toward a more right-wing, authoritarian positioning, carefully tracking the Liberals. I have summarised the shift from mild “right” to mainstream “right-wing” policy that the Labor Party has followed through the last three elections as depicted by the analysis of http://www.politicalcompass.org/. This shift shows up in the adjacent chart. ..and just a jump to the Right. As you can observe, with each successive election each party has become more right wing and more authoritarian. By 2013 the Labor Party’s position is to the right of the National party’s position in 2007. The National party has historically always existed a little left of the Liberal Party but a little right of the Labor party. Given the bipartisan agreement around the pursuit of strict law and order agendas, globalisation of trade, meta data retention, increasingly disproportionate ill-treatment of refugees, criminalisation of abuse reporting and privatisation of public assets it is not hard to deduce the policy direction. Given none of these systems were bought before the 2013 election, it is reasonable to assume that both parties have moved further to the “right” / “authoritarian” positions. If the Liberal party’s shift to the far right, is to your mind unacceptable, you only have to refer to the criticisms levelled by former leaders of the Liberal party such as John Hewson, Malcolm Fraser and even John Howard in regards to the direction Tony Abbott’s leadership has been taking the party. 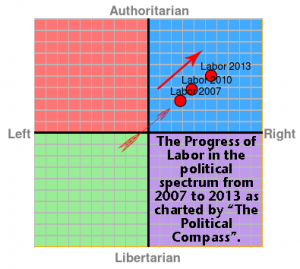 The analysis by “The Political Compass”, highlights the absurdity of the assumption that the Liberal and Labor parties are opposing political spectrums. The fact that Labor’s current political position is further to the right than that of the Nationals when John Howard lost power, almost suggests that if the coalition with the Nationals is not working out for the Liberal party, quite frankly, the current Labor Party is a better contender as an alternative. If you find that statement disturbing, perhaps it is because you haven’t bothered to follow the changes in political perspective and policies of the respective parties. For many citizens of Australia, they are making assumptions about where they are by your age and the perspective you had of whom they were when you were first contemplating for whom to vote. For many, that perspective guided by their family’s preferences, continued irrespective of the impacts of those policies on the country or for that matter, themselves. The excessive pride, which so many Australians exhibit in being apolitical or disengaged with the political process, is indicative of a lack of tracking by Australians of how politics and policies have changed. So if you are a baby boomer, such as myself, and you remember the era of Gough Whitlam (and the massive changes to the socio economic structure of Australia under the Labor Party), and you are as politically disengaged – as far too many Australians are – it is indeed possible you have stayed with that view. For such individuals, there is no real awareness that the Labor Party has not been a left-wing party for a very long time. 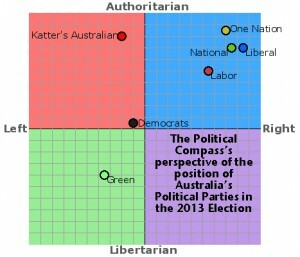 In fact, the only real left-wing parties in existence anymore according to “The Political Compass”, are the Democrats, Bob Katter’s party and the Greens. Sadly, Don Chip’s political ambitions to “keep the bastards honest”, has been mostly lost to history, as the party faithful has diminished over time and their representation in political office ended in 2008. Bob Katter – while initially a member of the National Party – formed his party in 2011 and remains as a member of Parliament – neither gaining or losing ground. The Greens party, on the other hand, have increased in numbers taking up ground where the Democrats once trod and informed traditional Labor voters, even taking on board as members former federal and state party politicians from the Democrats. So regarding the left/right divide of the political spectrum, it is incorrect to think of it as between the ALP and the LNP. 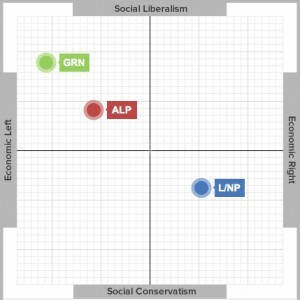 The real divide between left and right policies, ideologies, and social causes are largely between the Greens on the left and the Labor/National/Liberal coalition on the right. Not of course, that the Liberals or Labor party would consider themselves such a coalition, given their antipathy. 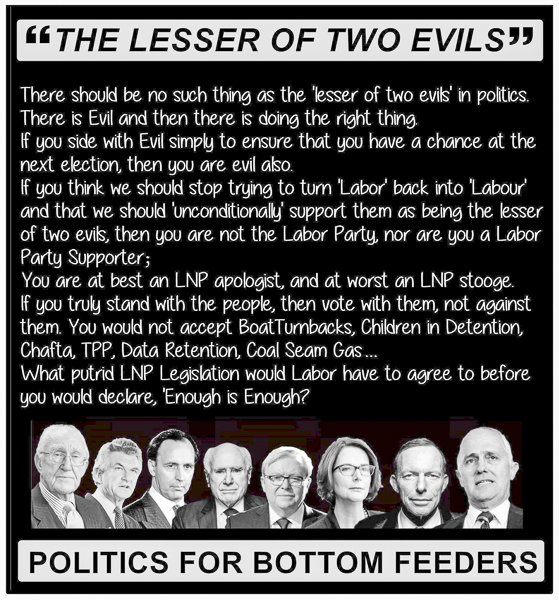 Considering that the Labor party holds a political policy position further to the right and closer toward authoritarian than the Liberal party’s partners (The Nationals) during the Howard years; the conception of them being in a coalition is not without some merit, even if an unpalatable sentiment to both parties. The changing tide for 2016 and the direction of the main parties? Further questions facing the Australian punter when deciding upon whom they should cast their vote in 2016. We should evaluate parties regarding their real and current political persuasions in the 21st-century rather than what they were in the 20th century. The “left” is no longer the left! And the “right” has moved more toward “fascist” than any other party in Australian history. The comparisons of the current LNP party with fascism have been prolific in social media over the last two years and none more so than the recent “border force” fiasco in Melbourne. If, as the proponents of the Reclaim Australia movement or the Patriotic Youth League, this is indeed the form of government you desire, then most certainly, the Liberal party – as defined by Tony Abbott or One Nation – are the parties for whom to vote. If on the other hand, you consider yourself a mild to moderate right wing constituent, then the Labor Party is the only real option available. Taking the political compass test at https://www.politicalcompass.org/test will certainly provide you with your positioning in the political spectrum. 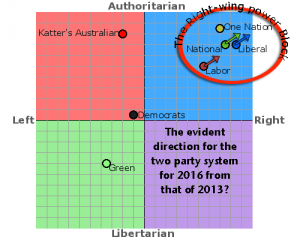 Should in that process, you discover your leanings are significant enough to the left of the Labor/National/Liberal/One Nation right-wing power block, then you have three options depending on how progressive or authoritarian you want Australia to be. Bob Katter and the Democrats will probably not have representation in every electorate, and where that is the case, the only party that has representation throughout Australia and holds left wing policies is “The Greens”. Is your choice the lesser of two evils? As 2015 draws to a close and the political parties clamour for your attention and your vote, perhaps it is in your best interest to take “The Political Compass” test, if only to understand and be aware of your position and opinion and where it fits into today’s Australian political spectrum. In doing so, perhaps you might abandon the fixed impression you’ve held for a decade or more in the past, where the party you always voted for has moved to in the dynamic and ever moving landscape of Australian politics. What’s in it for ……? While there is inevitably, the hedonistic approach to politics, which so many politicians count on, to garner your vote, of “What’s in it for me?”, as opposed to “What’s in it for my country?”, might I remind you in your considerations, of the words of Gough Whitlam when writing in the London Daily Telegraph in October of 1989.